An essential resource for the 21st century and our future. I first heard about Zenergy when I was working as an event organiser in New Zealand. I spent a lot of time in meetings with organisers, sound technicians, artists, workshop facilitators and venue managers. I realised that some meetings were uplifting, energising and positive whilst others seemed like a total waste of time without any clear outcomes achieved. When I first discovered Zenergy’s approach to facilitation through a friend, I was immediately drawn to learn more about facilitation as an art form that could transform meetings into a consistent source of inspiration and productivity. What I came to discover during the programme was that with the right set of tools, a bit of guidance and some hands-on experience, facilitation, like any craft, can be learned and mastered. The results were magic; Tapping into the collective intelligence of a group is like striking gold. More and more organisations are starting to understand the true power that arises when individual members meet as equals with a shared purpose. It requires the perspective that each person holds a key piece of a puzzle. Creating the conditions where every member can share their gift with the group is part of the work of a facilitator. The overall picture that is revealed is often beyond what each individual can contribute or imagine on their own i.e. The whole is greater than the sum of its parts. This is what makes facilitation a relevant model for the new paradigm: a progressive and effective solution to the issues we face collectively in our work environments, community structures and on the planet. I decided to explore this further and began my Zenergy training in August 2015. 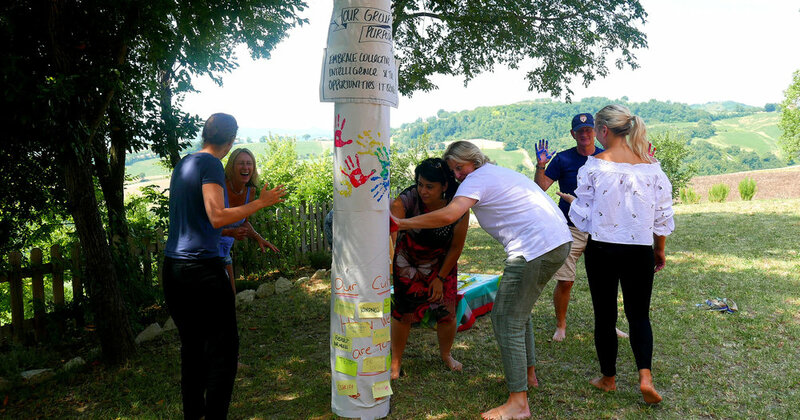 I found myself on a 5-day intensive journey with a group of teachers, project leaders, CEO’s, coaches and artists. Apart from the self-growth and self-confidence the program cultivated, the skills-acquisition aspect was full and varied. Here are some of the key capabilities we developed. The primary role of a facilitator is to keep the group focused on its purpose (why we are here) and act as a guardian of group culture (how we will work together). Clearly establishing purpose and culture creates the necessary foundation from which the group will function. Without these two core pillars, the group will be purposeless and may become discordant. To serve the group well facilitators need to be fully present and maintain presence regardless of what is happening around them. A skilled facilitator is sensitive to the slightest variations in group energy, dynamics and input. They are constantly monitoring in real time the aliveness and functioning of the group and making the necessary adjustments or interventions to help keep the group directed towards its purpose. The whole person approach acknowledges the intelligence centres of our gut, heart and mind as tools for recognising truth and for learning. Current scientific evidence shows that our gut ‘the second brain’ contains some 100 million neurons, more than in either the spinal cord or the peripheral nervous system. This multitude of neurons in the enteric nervous system enables us to recognise the inner wisdom of our gut - our intuition. Research at the Heart-Math institute has revealed that the heart is, in fact, a highly complex information-processing centre with its own functional brain, commonly called the heart brain, which communicates with and influences the cranial brain via the nervous system, hormonal system and other pathways. According to Zenergy true learning takes place in the whole body, when the head (what we understand) and belly (what we experience) flow together and are integrated with our heart (does it feel right to us). Facilitators understand that working through conflict can lead to greater resilience in the long-term. Therefore, conflict is not regarded as negative per se and is seen as an important stage of the development of a group. It often calls for sensitive and creative facilitation which encourages deep listening whilst searching for alignment. When conflict is destructive it requires intervention to prevent escalation. Facilitators handle conflict by instilling a safe environment where conflicting parties are held and heard. This, in turn, leads to healing the conflict. A working group is a living system with its own unique character, potential and limitations. A facilitator needs to discern when to allow the unique self-expression of the group to unfold without interfering. Trusting the process set in motion; a facilitator is able to be present with the group whilst stepping into unknown territory giving space for something new to emerge. The experiential nature of the workshop means that participants are coached and receive feedback from programme leaders and each other as they facilitate the group. Working with a reflective self and peer feedback tool after each session enables the facilitator to harvest their learnings and insights. A recent white paper from O.C. Tanner notes that nearly 80% of people who quit their jobs do so because of a lack of appreciation at work. Celebrating milestones and acknowledging achievements is an important lubricant in organisational harmony. Facilitators recognise how vital these qualities are and support the group in incorporating them into group processes. Many organisations are evolving from fixed and static structures to fluid and virtual models. Organisational development is focusing more on flexibility, responsiveness and managing changing configurations of people in different project teams. Short term contracts and self-employment are becoming more common. As facilitation skills are becoming sought after in many management and specialist positions in today’s employment landscape, the relevant training and skills are also becoming widely available. My experience training with Zenergy provided me with a solid foundation from which to approach group-work in all situations. Although at times challenging the program offers participants insight into turning ineffectual group meetings into juicy and enriching gatherings of brilliance and beauty. The creative and open-minded attitude of the coaches gives one the sense of being part of a new wave of innovation and ingenuity in the world; what is felt as the impulse of the avant-garde. A truly illuminating experience that I recommend to anyone who is passionate about bringing forward positive change and making a meaningful impact. The next Zenergy Stage 1: Discovering Collective Intelligence takes place on 23 - 27 July 2018 in Santa Monica, California. For more information and to register click here.